Our 3, 4 and 5 day multi-adventure programmes, described below, are all-inclusive OFFERS (including accommodation, food and adventure sports) as such they enjoy considerable DISCOUNTS. These programmes have been organized to include the most important and popular adventure activities in the area, including Canyon descents of different levels of difficulty in the Alquézar surrounds, Rafting River Descent on the River Ésera and River Gállego, Vías Ferratas in different parts of Sierra de Guara, Paintball, and Climbing. 3 days Multi-adventure Pack all Included from 190€. 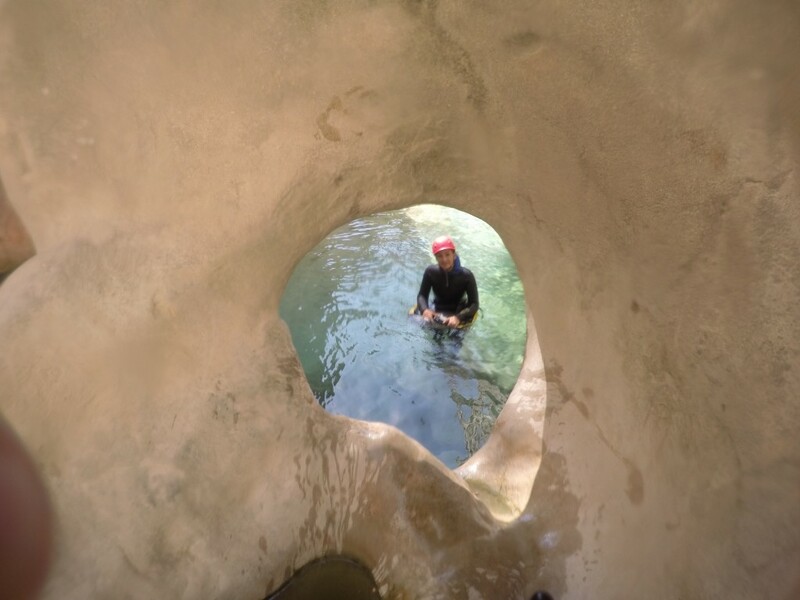 Canyon descent, aquatic descent without abseil. Activity Programme only (without accommodation). Includes: 3 activities + 3 nights accommodation. *Breakfast and picnics are not included. All prices shown are per person and include VAT. Package available from 15th March to 15th October. Price per person in a double room without balcony. All prices shown are per person and include VAT. Please ask about prices for apartments for 2 to 3 people. Includes: 4 activities + 4 nights accommodation. Rafting River Descent on the River Ésera or River Gállego. Includes: 5 activities + 5 nights accommodation. Canyoning material: long 2-piece 5mm neoprene wetsuit, full harness with double lanyard, helmet, backpack, watertight container, and neoprene socks. Rafting material: oar, neoprene wetsuit, helmet and life jackets (6-7 people per raft). Material for the Aerial Activity Circuit and Treetop Walking: harness with double lanyard, ropes for knotting, caribiners for zip wires, stirrups etc. Journey in a 9-seater taxi from Alquézar to the car park of Tozal and the Mallata cave paintings. Route Book with descriptions and photos of the entire route. Cultural explanations about the paintings. Map of the route. Vía Ferrata material: helmet, harness, energy absorbers, ropes for knotting. Insurance is also included for medical assistance, rescue and public liability. We have numerous accommodation establishments available in Alquézar and in many villages in the surrounding areas. Just choose the accommodation that best suits your needs. It’s as easy as that. Our rural accommodation can be seen here. Fill out this form to receive more details and book any of our programmes. I have read and accept the Privacy Statement of this web site.